Below is the information on our 1950 (which we now realize may be a 1949?) F1. 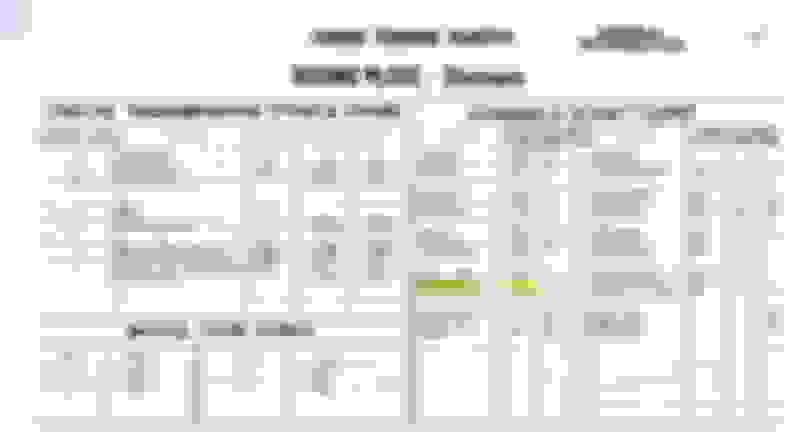 Can anyone help decipher the above information? If in fact our truck is a 1949 and not a 1950 as registered, does anyone have any experience with getting that changed? The firewall code tells most of what you want to know. 29M was assembly date of 29 Dec. It is technically a 49, but it couldn't have made it to a dealer until January1950. Even trucks built much earlier were titled in the next calendar year - when they sold at the dealership. So I wouldn't sweat it and just keep calling it a '50 as it has been. Enjoy the truck and thanks for playing along! the previous owner tells me its a 1950 and has a good backstory knowing the original owner. It's entirely possible that a truck built mid-Sept could sit on a dealer's lot for a couple of months. Some localities titled in the calendar year of purchase, not manufacture. If your title is clear and lists it as a 50, you're safe calling it a 50. Nothing of any consequence changed during those two model years anyway. I've cataloged over 900 trucks and have 21 with HP stampings so Highland Park MI seems to be normal. If your truck was red the rest of your firewall stamping would read 2HP17J243 or EHP17J243. HP looks like one of the earlier plants to switch to a letter for color code. 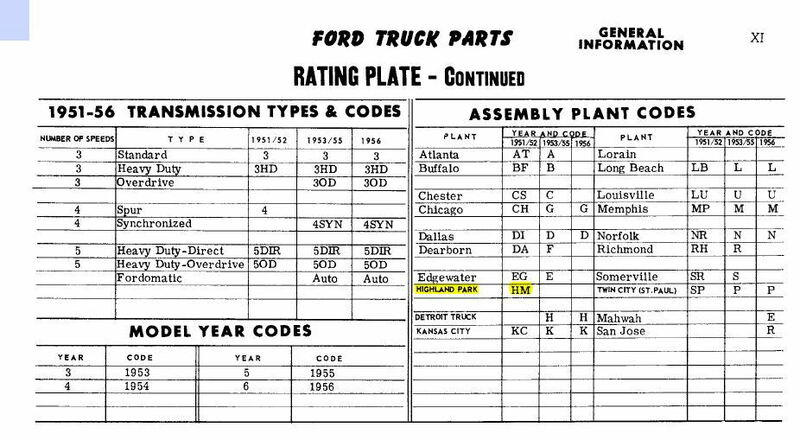 Tim is probably correct about the HP, I originally thought it was Highland Park, but the only documentation I could find from Ford was from the parts book that shows that they used HM for 51/52 model years in the serial numbers. But they may have changed that designation when they changed the serial number system after 1950. So what should i choose and what would be the reasoning/ benefitif any at all? we looked on the drivers side frame top from the firewall to the frame horn and nothing, is it some where else? near the motor mount. They are not punched too deeply, so be careful removing any grime. Here's where mine is located. Ser# 098RT154497 on the firewall tag. 4 speed on floor non synchro. 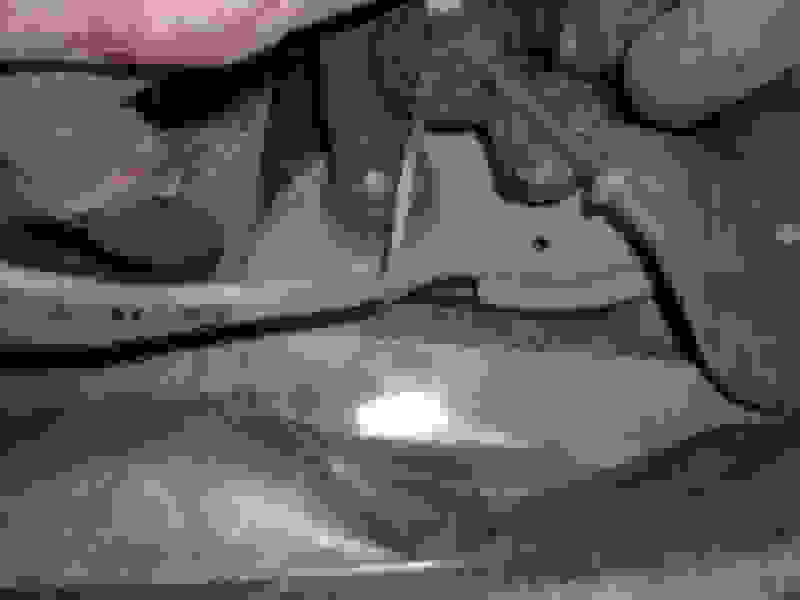 The vin appears 3 places: top of the frame rail as indicated above, the data plate on the firewall near the starter solenoid, and on the rating plate fastened to the glovebox door. It should have the same number all three places. The frame number is the only legal one for police inspection. All states differ in the process to get a title. My info on vins is good only on 48-50s. Before and after that narrow window I only know bits and pieces. 51/52 could very well use HM in place of HP. 51/52 could very well use HM in place of HP. The Parts Catalog agrees with that. Thanks for the info. I have a clean North Dakota title and am going to transfer it to a MI title shortly. Last one ever made or still in existance? I don't think you'll ever be able to know that for sure. There's too many undocumented trucks still in existence, and way too many that we could never account for on this forum. But mid-November is pretty late in production, so you have at the very least, one of the last ones built for 1950. Keep in mind, though, that there were a dozen plants cranking these out, and in 6 weeks there were thousands more built after yours.